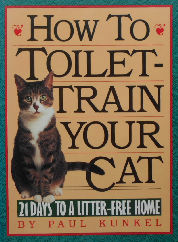 This classic book provides step by step instructions on how to toilet train your cat in 21 days. The paperback book is 5 1/4" wide x 7" high, 123 pages, illustrations throughout. Copyright 1991. Previously owned but in good condition.